Don't miss out! Our tours sell out quickly, book early to avoid disappointment. Franz Josef Glacier (Kā Roimata o Hine Hukatere) is widely regarded as one of the most unique glaciers in the world. This is because of its location in a temperate rainforest and the fact that it's one of the fastest-moving glaciers around. 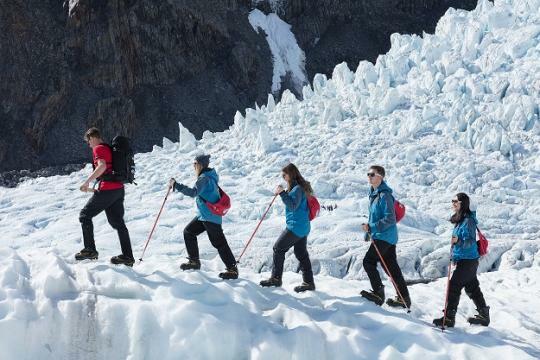 We've created a range of tours that explore these unique features up close, providing a spectacular glacier experience whatever your ability or budget. Walk the path of the glacier's history along the Waiho riverbed and discover all it has left behind. Experience the thrill of a helicopter flight, landing high up on the ice to explore the glacier, or challenge yourself with an adrenaline-packed ice climb. After a day exploring the glacier with us, we invite you to relax and reflect on your adventure with complimentary access to the Franz Josef Glacier Hot Pools. The perfect end to an unforgettable day.